The Battle of the Badges rib eating contest will be a highlight of the Tip-A-Cop fundraiser. Our law enforcement volunteers are at it again with the Battle of the Badges on Saturday, June 24 at Texas Roadhouse on Outer Loop. It’s expected to be another rib-rollicking fundraiser that promises to be a great time. In the interest of friendly competition and to support Special Olympics athletes, Louisville law enforcement officers and firefighters will face off in a rib-eating contest that afternoon. Teams representing both will see who can down the most legendary Texas Roadhouse ribs before time runs out. The Battle of the Badges will be the highlight of a Law Enforcement for Special Olympics Kentucky Tip-A-Cop fundraiser at the restaurant that will run from 11 am to 2 pm. Officers will be assisting Texas Roadhouse servers in exchange for extra tips to benefit Special Olympics Kentucky athletes. The contest is expected to be held around noon. The Battle of the Badges and other Tip-A-Cop events are just one of the many fundraising and awareness increasing events that the Law Enforcement for Special Olympics Kentucky group produces to support Special Olympics Kentucky each year. Law Enforcement officers from throughout the state work to help raise more than $100,000 for the program annually. 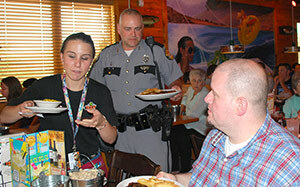 Texas Roadhouse is the largest single supporter of Special Olympics Kentucky. Through events like Battle of the Badges, the Texas Roadhouse Armadillo Classic and hosting Polar Plunges and Truck Pulls, Texas Roadhouse contributes or helps raise nearly $200,000 per year for the organization. For more information about the Battle of the Badges and Tip-A-Cop event, please contact Steve McGill, Special Olympics Kentucky Torch Run Liaison at 502-321-2894 or smcgill@soky.org.